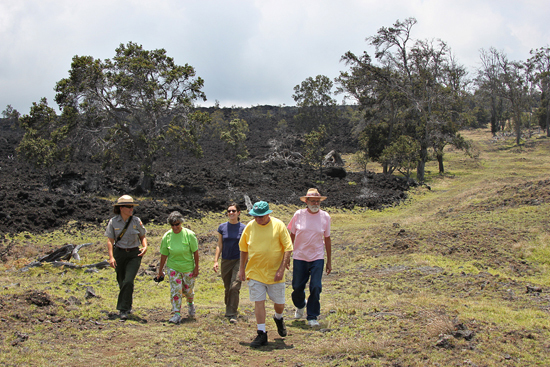 A new 4.5 mile hiking trail is open for visitors to Kahuku in Hawaii Volcanoes National Park. The Kona Trail is one of the most diverse trails in the Kahuku area. Located between 3,880 and 4,440 feet above sea level, the Kona Trail offers sweeping views of Ka Lae, the Ka‘u coast, and it encounters a rugged lava landscape from the 1887 Mauna Loa flow. The moderate loop trail meanders through old pastures and native forests, and alongside native plant restoration areas. Kahuku is located on Highway 11, near mile marker 70.5 on the mauka side of the road. The Kona Trail is about 5.5 miles from the Kahuku entrance up a steep, rough and rocky road. Four- wheel drive is strongly recommended. Parking for the Kona Trail is at the Lower and Upper Glover Trailheads.